Gary (The Cheif Executive Officer of the South China Morning Post, Gary Liu), distinguished members of the adjudicating panel, awardees, ladies and gentlemen, good evening. I'm very pleased to be here, with you, tonight for this year's "Spirit of Hong Kong Awards" ceremony. Indeed, this is an occasion that I have been looking forward to amongst my many many commitments, because it is always very uplifting to come to this occasion which I have the honour of doing it once or twice in my position as the Chief Secretary for Administration. The annual awards, which began in 2013, celebrate the spirit of Hong Kong, illuminating some of the countless ways in which our 7.4 million people can come together as a community inspired by shared values and goals. Today, more than ever, we need to spotlight, and embrace, our collective vision for Hong Kong, hopefully, because we have a new term of government which has just started. Tonight, we honour five individuals and two corporate citizens for their selfless efforts on behalf of the people of Hong Kong. Like the award winners of previous years, the individuals and corporate entities we applaud this evening are champions of Hong Kong. Our community, its values, culture and diversity. You will meet them one by one in just a few moments. But before you do that, allow me to thank them on behalf of the people of Hong Kong. Each awardee serves as a role model for what can be done. Each shows us that a stubborn willingness to help others, to make a difference, can make all the difference. 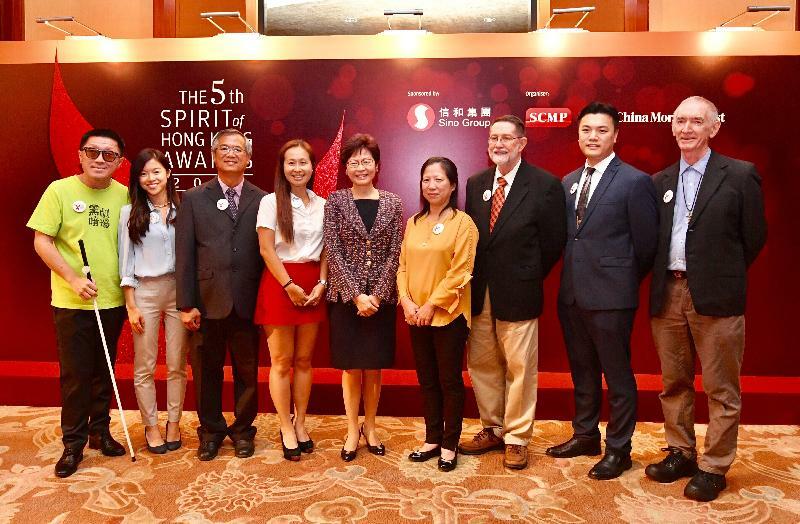 Collectively, this year's Spirit of Hong Kong winners bring help, and more importantly hope, to the disabled and the elderly, minister to the sick, feed and help the homeless, and work to preserve our unique culture. For that, and so much more, we are humbled and grateful. It's important to note, as well, that there are many more out there working selflessly for the people of Hong Kong. Indeed, this year's honorees were among 147 nominations. That, ladies and gentlemen, more than doubled the number of nominations received in 2016. We are, in short, blessed as a city, as a community. And if we continue to work together for the common good, the spirit of Hong Kong will surely reward us all, long into the future. My thanks to each and every one of this year's nominees. You make me proud – you make us all proud – to call Hong Kong, this place, our home. 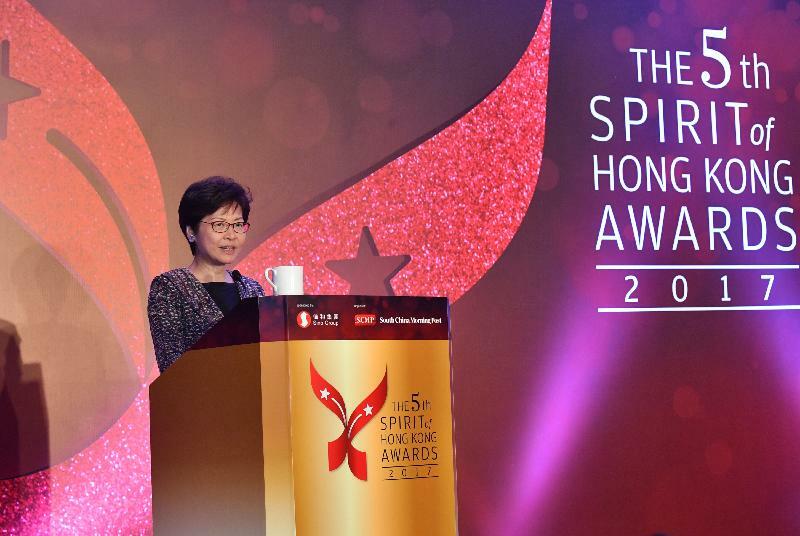 My thanks, too, go to the South China Morning Post, creator and organiser of the Spirit of Hong Kong Awards, and to all those involved in making the awards a guiding light over these past five years. So let’s have a rewarding and enjoyable evening. Thank you very much.